Some of you may think I'm a girl, but I'm not. 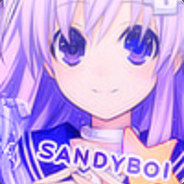 Yeah.. having Sandy in SandyBoi does make it confusing but, "Sandy" is just a nickname derived from my real name - a nickname which a girl I know from high school just suddenly made up one day, lol. Caught on pretty quickly, even after I moved to another high school. Just another typical dude who enjoys playing games. Visual novels too. I also enjoy reading manga, light novels, some web novels and watching anime.